Daniel Constantine Marino Jr. (born September 15, 1961) is a former American football quarterback who played seventeen seasons for the Miami Dolphins of the National Football League (NFL). After a successful college career at Pittsburgh and being named First-team All-American in 1981, Marino was the last quarterback taken in the first round of the quarterback class of 1983. Marino held or currently holds dozens of NFL records associated with the quarterback position, and despite never being on a Super Bowl-winning team, he is recognized as one of the greatest quarterbacks, and generally considered to be among the best pure passers in American football history. Best remembered for his quick release and powerful arm, Marino helped the Dolphins become consistent postseason contenders, leading them to the playoffs ten times and one Super Bowl appearance in XIX, although a title victory ultimately eluded him during his career. Marino is considered by many to be one of the greatest players to never win a Super Bowl and has the most career victories of quarterbacks to not win a title at 155 (147–93 in regular season and 8–10 in playoffs). A nine-time Pro Bowl selection, eight-time first or second team All-Pro, and All-AFC six times, Marino was voted NFL Rookie of the Year by several media outlets. The following season in 1984, Marino was the NFL Most Valuable Player (MVP), when he set single season records of 5,084 passing yards, 48 touchdown passes, nine 300-yard passing games, and four 400-yard passing games. He was voted the 1994 NFL Comeback Player of the Year, and the 1998 Walter Payton NFL Man of the Year. At the time of his retirement, Marino held more than 40 NFL single season and career passing records (many of which have since been surpassed), including career passing attempts (8,358), completions (4,967), passing yards (61,361), and touchdown passes (420). 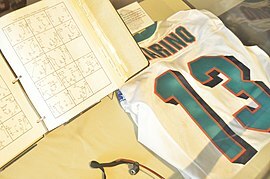 Marino was inducted into the College Football Hall of Fame in 2003, inducted into the Pro Football Hall of Fame in 2005 in his first year of eligibility, and is currently one of only three former Miami Dolphins to have his jersey number (no. 13) retired. Marino was born in Pittsburgh, Pennsylvania, of Italian and Polish ancestry. He is the eldest child of Daniel and Veronica (Kolczynski) Marino, and has two younger sisters, Cindi and Debbie. His father delivered newspapers for the Pittsburgh Post-Gazette. Marino grew up on Parkview Avenue in the South Oakland neighborhood of Pittsburgh, and attended St. Regis Catholic Elementary School. He attended Central Catholic High School in Pittsburgh, where he started in baseball, and won Parade All-American honors in football. He was drafted in the 4th round by the Kansas City Royals in the 1979 amateur draft, but decided to play college football instead. Marino attended the University of Pittsburgh, and played for the university's Pittsburgh Panthers football team from 1979 to 1982. As a freshman in 1979, Marino led the Panthers in a 24–17 triumph over West Virginia in the Backyard Brawl and a 29−14 win over longtime rival Penn State. Pitt's 1980 Marino-led team finished No. 2 in the season ending rankings (The New York Times computer poll rated Pitt as No. 1). Following the 1981 regular season, Marino led the Panthers, who had been ranked No. 1 most of the season, to a last-minute triumph over the No. 7 Georgia Bulldogs in the 1982 Sugar Bowl by throwing a game-winning pass to tight end John Brown with less than a minute remaining in the game. Marino later cited this as the most memorable pass he'd thrown in his college career. Overall, during the three seasons from 1979 thru 1981, Pitt garnered 33 wins with only 3 losses (three straight 11–1 seasons) and was constantly ranked in the Top 5 of both major media polls. 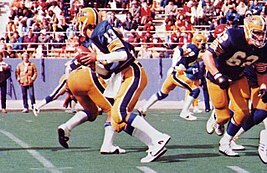 The Pitt football team's fortunes and Marinos's statistics dipped during his senior year, which saw the team transition from head coach Jackie Sherrill to new coach Foge Fazio, culminating in a 7–3 loss in the 1983 Cotton Bowl Classic to Southern Methodist University and their "Pony Express" of Eric Dickerson and Craig James. Marino finished ninth in voting for the Heisman Trophy in 1982, after finishing fourth the previous year. Marino finished his four college seasons with 7,905 passing yards and 74 touchdowns, with 64 interceptions. Marino's selection status in the 1983 NFL Draft plummeted after his weaker senior season at Pitt, and rumors of recreational drug use. Five other quarterbacks—Ken O'Brien, Tony Eason, Todd Blackledge, and Hall of Famers Jim Kelly and John Elway—were drafted ahead of him in the first round. Bill Hillgrove, who was with the Marino family on draft day, later recalled that when the New York Jets selected O'Brien, Marino "became visibly ill". (O'Brien, who played for Division II Cal-Davis, was so obscure that Marino later asked his agent Marvin Demoff "Who is Ken O'Brien?") The Miami Dolphins chose Marino as the 27th pick in the first round. Opinion was divided on the wisdom of the team's decision; Chris Berman said that the Dolphins' head coach Don Shula was "the best", but Paul Zimmerman was skeptical of the coaching staff's ability to help Marino "overcome the problems he's had". Shula later said that being passed up by so many teams "motivated [Marino] to show everybody else what a mistake that they had made." Marino was the first draft pick in the history of the United States Football League, selected by the Los Angeles Express. He did not sign with the team, choosing instead to sign with the Dolphins. After starting the season as a backup to incumbent starter David Woodley, Marino was given his first NFL start in Week 6 versus the Buffalo Bills. Marino and Miami lost that game 38–35 in overtime. As a rookie, Marino set several records: he posted a 96.0 passer rating, he was selected to the Pro Bowl as a rookie, he had the lowest percentage of passes intercepted with 2.03, he was the only rookie quarterback to lead a conference in passing, and he had the highest passing completion percentage with 58.45. The Dolphins finished the season with a 12-4 record and advanced to the AFC divisional playoffs, where Marino threw two touchdown passes in his playoff debut. However, he also threw two interceptions as the team lost to the 9-7 Seattle Seahawks, 27-20. In his second season, Marino broke six NFL full-season passing records, including the records for most touchdown passes (48, surpassed by Peyton Manning in 2004) and most passing yards (5,084, surpassed by Drew Brees in 2011), and was selected as the NFL's Most Valuable Player. The Dolphins finished with a 14–2 regular season record, clinching home-field advantage for the playoffs. In the Divisional round, the Dolphins avenged their playoff loss of the previous season to Seattle Seahawks 31–10 behind Marino's 262 passing yards and 3 touchdowns. The next week the Dolphins defeated the Pittsburgh Steelers in the AFC Championship Game 45–28. In that game, Marino set AFC Championship Game records with 421 passing yards and 4 touchdowns. Both records still stand as of 2019[update]. In Super Bowl XIX, Marino and the Dolphins faced off against San Francisco 49ers and Joe Montana in Palo Alto, California. The Dolphins, who had 74 rushing attempts in the previous two weeks, ran the ball only eight times in this game. Marino finished with 29 completions out of 50 attempts for 318 yards, throwing one touchdown pass and two interceptions. The Dolphins lost 38–16 in what was Marino's only Super Bowl appearance. In 1985, Marino threw for 4,137 yards and 30 touchdowns while leading the Dolphins to the AFC Championship game. On September 29, Marino threw for 390 yards and 3 touchdowns in the Dolphins' 30–26 victory over the Denver Broncos, in the first matchup between Marino and Broncos quarterback John Elway. Then on December 2, Marino threw for 270 yards and 3 touchdowns against the vaunted Chicago Bears defense in a 38–24 victory. The loss was the only one that the Bears experienced that season. Marino led the league in yards and touchdown passes and was named first team All-Pro in 1985. On September 7, 1986, 8 days shy of his 25th birthday, Marino threw his 100th touchdown pass in a 50–28 loss at San Diego. Marino accomplished that feat in just 44 games- the fastest in NFL history. In that 1986 season Marino threw for 4,746 yards and 44 touchdowns. Marino became the first QB in NFL history to record three consecutive seasons of 30 or more touchdown passes; 48 in 1984, 30 in 1985 and 44 in 1986. Marino again led the league in yards and touchdown passes and was named 1986 first team All-Pro. In 1988, Marino threw for 4,434 yards and 28 touchdowns. As a result of his 4,434 yards passing, Marino became the first QB in NFL history to throw for 4,000 or more yards in four different seasons. Marino had been tied with Dan Fouts for the most 4,000 yard passing seasons with three. In 1992, Marino again led the Dolphins to the AFC Championship game while passing for 4,116 and 24 touchdowns. His 4,116 passing yards led the entire NFL and marked the fifth time in his NFL career that he led the league in passing yards. In 1993, Miami was strongly favored at the start of the year to make it back to the AFC championship game and possibly the Super Bowl. However, after throwing a swing pass at a game in Cleveland, Marino, who was untouched on the play, crumpled to the ground in pain with a torn Achilles tendon and was out for the season. Marino later said, "I felt like I got kicked". Backup quarterback Scott Mitchell had an impressive series of starts before suffering an injury of his own. Steve DeBerg started the last 4 games of the season. Mitchell signed a free-agent contract with the Detroit Lions, and Miami signed veteran quarterback Bernie Kosar from the Dallas Cowboys as a backup. Wearing a special shoe on one foot, and having a right calf that was visibly atrophied, Marino was the starting quarterback at the opening of the 1994 season. In the 1994 season opener, a home game versus the New England Patriots and quarterback Drew Bledsoe, the two quarterbacks put up a combined 894 yards (Marino, 473 yards; Bledsoe, 421 yards) and nine passing touchdowns (Marino, 5; Bledsoe, 4), with Miami winning 39–35. Later in the season, Marino led a comeback win on the road against the New York Jets (28–24), a game famous for Marino's execution of a fake spike for the winning touchdown pass, a play known as "The Clock Play". The Dolphins finished 10–6 that year, and Marino passed for 4,453 yards and was named the NFL's Comeback Player of the Year by the Pro Football Writers Association. After missing the postseason in 1993, Miami came back to the playoffs in 1994. Placing third overall in the AFC, Miami was pitted against the Kansas City Chiefs in what became the final NFL game played by Montana. Marino threw 257 yards and two touchdown passes, contributing to Miami's 27–17 win. The Dolphins reached the AFC Divisional Playoff round, where they competed with the San Diego Chargers. Three touchdown passes by Marino in the first half allowed the Dolphins to lead 21–6, before the Chargers staged a comeback and took the lead toward the end of the fourth quarter. In the final moments of the game, Marino tried to set up a good position for a field goal, but with little time left at the Chargers' 30-yard line, Pete Stoyanovich was forced to attempt a 48-yard field goal. Stoyanovich missed, ending the game with a 22–21 loss for Miami. Marino started in 14 out of 16 games in the 1995 season. He suffered a hip injury in week 6 against the Indianapolis Colts and was replaced by Bernie Kosar in the following two games. Throughout the regular season, Marino threw 3,668 yards, which included 24 touchdowns. Despite falling to 9–7 and to third place in the AFC East, the Dolphins again advanced to the playoffs because they placed sixth in the AFC. In the wildcard round against the Buffalo Bills, Miami dominated in passing – with Marino passing 432 yards – while Buffalo was far ahead of Miami for rushing yards (341 yards). In terms of scoring, Buffalo held a wide lead throughout the game. The Dolphins remained scoreless until the fourth quarter, when they scored 22 points, which included two touchdown passes from Marino. However, Miami fell well short of a comeback and lost 37–22. Marino's final win was his first playoff road win and his 36th comeback win, as the Dolphins defeated the Seattle Seahawks 20–17 on January 9, 2000 in the final football game ever in the Seattle Kingdome. In the next round (January 16), also on the road, Marino and the Dolphins lost 62–7 to the Jacksonville Jaguars. The Dolphins' 55 point margin of loss was the worst in AFC Playoff history. Marino was replaced by backup Damon Huard after playing one series in the second half. However, he did end the first half on a high note, leading the Dolphins on an 80-yard scoring drive and throwing a 20-yard touchdown pass to receiver Oronde Gadsden with 20 seconds remaining. The Jacksonville game marked the end of Jimmy Johnson's coaching career; Johnson announced his retirement the next day. Before the 2000 season, Marino decided to retire, after declining offers from Minnesota, Tampa Bay and his hometown of Pittsburgh when the Dolphins declined his option on his contract. Marino later admitted that he seriously considered the offer from the Vikings, but that he turned it down not because of his arm, but because he was not sure that his legs could take another season. He also appreciated the fact that unlike many of his contemporaries, he got to play his entire career with one team. During Marino's career, the Dolphins were perennial playoff contenders, reaching the postseason in 10 of his 17 seasons. He was selected to play in nine Pro Bowls (1983–1987, 1991, 1992, 1994, 1995), seven times as a starter, but due to injuries he only played in two of the games (1984, 1992). He was named first- or second-team All-Pro eight times and earned All-AFC honors six times. Marino won all three major individual awards: NFL MVP (1984); NFL Comeback Player of the Year (1994); and NFL Man of the Year (1998), which recognizes charitable work off the field. In 1999, Marino was ranked 27th on The Sporting News list of the 100 greatest football players, making him the highest-ranking Dolphins player. In 2010, he was ranked number 25 on the NFL's Top 100 Greatest Players list. Marino was known for his quick release, and despite the fact that he was not skilled at scrambling, Marino possessed an uncanny awareness in the pocket, often sliding a step or two to avoid the pass rush. Marino is currently fifth, behind Tom Brady, Peyton Manning, Brett Favre and John Elway on the list of most wins by a starting quarterback and, with 155, the most of a quarterback not to win a Super Bowl. On Sunday, September 17, 2000, at halftime of the Dolphins-Baltimore Ravens game at Pro Player Stadium, Dan Marino's jersey number of 13 was retired. The only other Dolphins jersey number retired at the time was Bob Griese's #12. Since then #39, Larry Csonka, has been retired as well. Marino joined the Dolphins Honor Roll the same day. In a year of accolades from the franchise he led for many years, the Dolphins also installed a life-size bronze statue of Marino at Pro Player Stadium (now Hard Rock Stadium) and renamed Stadium Street to Dan Marino Boulevard. In 2003, Marino was honored for his outstanding NCAA career at Pitt with an induction into the College Football Hall of Fame. In early 2004, Marino briefly returned to the Miami Dolphins as Senior Vice President of Football Operations, but resigned from the newly created position only three weeks later, saying that the role was not in the best interest of either his family or the Dolphin organization. Marino was elected to the Pro Football Hall of Fame in 2005, one of only four Dolphins to be elected in their first year of eligibility (Jim Langer, Paul Warfield, Jason Taylor). He was inducted into the Hall of Fame on August 7, 2005 and was introduced by his oldest son, Daniel. During his induction speech, Dan threw "one last pass" to former teammate Mark Clayton, who was sitting in the audience. Marino was an analyst for CBS's Sunday pregame show The NFL Today, from 2002–2013. On February 18, 2014, it was announced that Marino, along with Shannon Sharpe were being relieved of their duties as on-air commentators on The NFL Today and were being replaced by Tony Gonzalez and Bart Scott. He was formerly a studio analyst on HBO's Inside the NFL, from 2002–2007. On August 24, 2014, Marino announced he would return to the Dolphins as a special adviser. In 1997, Marino became involved in a marketing role with Team Cheever of the Indy Racing League through FirstPlus Mortgage, the sponsor of the car. In 1998, Marino co-owned a NASCAR Winston Cup Series racing team with driver Bill Elliott, creating Elliott-Marino Motorsports. 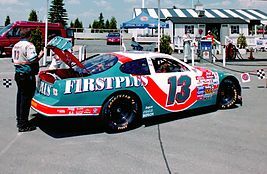 The team's car number was #13, Marino's uniform number, and had primary sponsorship from FirstPlus Mortgage, whose company colors, coincidentally, were turquoise, orange, and white – similar to aqua and coral, the team colors of the Miami Dolphins. The team chose rookie driver Jerry Nadeau to pilot the car at the start of the season; he was later released and the team went through a rotation of drivers. The team failed to qualify for several races, but did post a top-5 finish at Phoenix International Raceway late in the season with Ted Musgrave driving. The team only lasted the 1998 season and closed afterward. The Dan Marino Foundation was established in 1992 by Marino and his wife, Claire, after their son, Michael, was diagnosed with autism. The foundation has distributed over $22 million to research, services, and treatment programs serving children with neurodevelopment disabilities. The Dan Marino Center, which opened in 1995 along with the Miami Children's Hospital, is an integrated neurodevelopmental center specializing in the diagnosis and treatment of children at risk for developmental and psychological problems. The center saw more than 48,000 children last year alone. Marino has teamed with other celebrities to raise awareness about autistic spectrum disorders, including fellow NFL quarterback Doug Flutie, whose son also has an autism diagnosis. On November 7, 2005, the National Basketball Association's Miami Heat honored Marino's charitable works and recognized his service to South Florida with a halftime tribute, as well as a large donation to the Marino Foundation. Though a Heat jersey with his name and #13 was unveiled, this did not constitute retirement of his number by the Heat, and was worn by Heat guard/forward Mike Miller as recently as the 2012/2013 NBA season. On March 23, 2010, The Dan Marino Foundation held its first "Walk about Autism". Over 6000 walkers participated, as well as 420 volunteers provided by the Miami Dolphins Special Teams. The money raised benefited several funds including the Autism Societies of Miami-Dade and Broward; the University of Miami-Nova Southeastern University Center for Autism and Related Disabilities; the Florida Atlantic University Center for Autism and Related Disabilities; and the Dan Marino Foundation. In 1995, Hootie and the Blowfish featured Marino in their music video for their single "Only Wanna Be with You." Marino is currently featured in advertisement campaigns for Hooters, NutriSystem weight loss programs, Maroone, Papa John's, Nutrasource.com and Empi Select (a TENS device). Previously, Marino endorsed Isotoner gloves and FirstPlus Mortgage against whom he later filed suit due to contracts related to his racing team. In April 2012, Marino became the AARP's "Men's Life Ambassador", through which he planned to share his point of view and expertise on a variety of men's interests, including health, fitness, sports, lifestyle, entrepreneurship, aging and community service, primarily through the website. In 1985, Marino married Claire D. Veazey (born c. 1962) of Mount Lebanon, Pennsylvania at St. Regis Roman Catholic Church, across the street from the home of Marino's parents. The couple have six children together. Marino was awarded an honorary doctorate degree in broadcast journalism by his alma mater, the University of Pittsburgh, in 2005. He delivered the commencement speech at the university's 2008 graduation ceremony. In January 2013, Marino admitted to fathering a child with CBS employee Donna Savattere in 2005, a fact he had only shared with his wife. He had previously paid Savattere several million dollars to keep the news of their daughter from the public. This list documents records set by Marino, some of which have since been tied or broken. Most touchdown passes, season: 48 in 1984 (surpassed by Peyton Manning (49) in 2004 and by Tom Brady (50) in 2007 and by Peyton Manning (55) in 2013). ^ Arthur, Kenneth (September 7, 2017). "Best active and retired NFL players without a Super Bowl ring". sportsonearth.com. MLB Advanced Media, LP. Retrieved January 10, 2019. ^ Pollin, Tom (June 30, 2017). "20 Best Players to Never Win a Super Bowl". foxsports.com. Fox Sports Interactive Media, LLC. Retrieved January 10, 2019. ^ a b Powell, Albrecht. "About.com Guide". Retrieved May 5, 2010. ^ Grupp, John (February 6, 2005). "Marino has come a long way from Parkview Avenue". Pittsburgh Tribune-Review. Archived from the original on March 3, 2010. Retrieved May 5, 2010. ^ "Video". CNN. February 17, 1997. Archived from the original on May 9, 2010. ^ "Face to Face with Dan Marino". Electronic Gaming Monthly. No. 86. Ziff Davis. September 1996. p. 134. ^ a b Baker, Chris (January 5, 1983). "... And Now to the No. 1 Task of Signing Marino: Express Make Pitt Quarterback Top Selection; UCLA's Ramsey Is Also on L.A. List". Los Angeles Times. p. D3. ^ a b "Elway to Marino". 30 for 30. Season 2. April 23, 2013. ESPN. ^ Schultz, Jeff (April 19, 2010). "Jonathan Dwyer will overcome bad pre-draft rumor | Jeff Schultz". Blogs.ajc.com. Archived from the original on July 16, 2010. Retrieved September 28, 2010. ^ "Dan Marino Page". Retrieved December 21, 2011. ^ "Awards". jrank.org. Retrieved July 14, 2007. ^ "Divisional Round - Seattle Seahawks at Miami Dolphins - December 31st, 1983". Pro-Football-Reference.com. Retrieved February 28, 2018. ^ a b "Dan Marino: Biography". Pro Football Hall of Fame. Retrieved February 10, 2015. ^ "Divisional Round - Seattle Seahawks at Miami Dolphins - December 29th, 1984". Pro-Football-Reference.com. Retrieved February 28, 2018. ^ "AFC Championship - Pittsburgh Steelers at Miami Dolphins - January 6th, 1985". Pro-Football-Reference.com. Retrieved February 28, 2018. ^ "Super Bowl XIX - San Francisco 49ers vs. Miami Dolphins - January 20th, 1985". Pro-Football-Reference.com. Retrieved February 28, 2018. ^ "1985 Miami Dolphins". pro-football-reference.com. Retrieved February 10, 2015. ^ "Miami Dolphins at Denver Broncos - September 29th, 1985". Pro-Football-Reference.com. Retrieved February 28, 2018. ^ "Chicago Bears at Miami Dolphins - December 2nd, 1985". Pro-Football-Reference.com. Retrieved February 28, 2018. ^ "Dan Marino". Miami Dolphins. Archived from the original on December 3, 2000. Retrieved February 10, 2015. ^ "Dan Marino: Highlights". Pro Football Hall of Fame. Retrieved February 10, 2015. ^ "Dan Marino Career Stats". National Football League. Retrieved January 28, 2016. ^ "The Deseret News - Google News Archive Search". news.google.com. ^ "Miami Dolphins Franchise Encyclopedia". Pro-Football-Reference.com. 2017. Retrieved April 5, 2017. ^ a b "Wild Card - Kansas City Chiefs at Miami Dolphins - December 31st, 1994". Pro-Football-Reference.com. Retrieved April 5, 2017. ^ Steve Wilstein (April 19, 1995). "Golden Boy says goodbye". The Gettysburg Times. San Francisco, California. Associated Press. p. 16. Retrieved April 5, 2017 – via Newspapers.com. ^ "Divisional Round - Miami Dolphins at San Diego Chargers - January 8th, 1995". Pro-Football-Reference.com. Retrieved April 5, 2017. ^ "Marino Retires". cnn.com. Retrieved July 14, 2007. ^ "TSN 100 Greatest". sportingnews.com. Archived from the original on November 5, 2005. Retrieved July 14, 2007. ^ Sterngass, Jon (2008). Dan Marino (Football Superstars). Chelsea House Publications. p. 62. ISBN 0-7910-9606-8. ^ Bouchette, Ed (February 6, 2005). "Marino Interview". post-gazette.com. Retrieved July 14, 2007. ^ Nate Davis (February 18, 2014). "CBS hires Tony Gonzalez, parts with two Hall-of-Fame analysts". usatoday.com. Retrieved February 18, 2014. ^ "Dan Marino accepts job with Dolphins". eSPN. August 24, 2014. Retrieved August 24, 2014. ^ Pockrass, Bob (January 31, 2014). "NFL and NASCAR: Former NFL stars who dabbled in stock-car racing". Sporting News. Archived from the original on May 22, 2013. Retrieved March 2, 2014. ^ a b "Dan the Man". nba.com. Retrieved July 14, 2007. ^ "Baltimore City Paper: Any Given Sunday | Movie Review". Citypaper.com. Archived from the original on June 3, 2012. Retrieved September 28, 2010. ^ "Any Given Sunday (1999)". ^ "Nutrisystem – Official Site -Diet Plans, Weight Loss Programs, Diet Programs, Lose Weight". Nutrisystem.com. April 6, 2010. Archived from the original on May 13, 2008. Retrieved September 28, 2010. ^ "Empi Products". Itookcontrolofpain.com. Archived from the original on December 26, 2008. Retrieved September 28, 2010. ^ Cawley, Rusty; Webb, Cynthia (September 3, 1999). "Race team sues FirstPlus – Dallas Business Journal". Dallas.bizjournals.com. Retrieved September 28, 2010. ^ "Miami QB Marino takes bride". The Oregonian. January 31, 1985. p. E7. ^ "FM | University of Pittsburgh News FM". News.pitt.edu. Retrieved September 28, 2010. ^ Mohr, Ian (January 31, 2013). "Exclusive: NFL legend Dan Marino had a love child with CBS employee in 2005". New York Post. Retrieved January 31, 2013. ^ "2010 NFL Record & Fact Book: All-Time Individual Records" Archived August 20, 2010, at the Wayback Machine 2010 NFL Record & Fact Book, p. 545-549. ^ "NFL Sacked % Single-Season Leaders". pro-football-reference.com. Sports Reference LLC. Retrieved January 10, 2019. ^ "NFL Sacked % Career Leaders". pro-football-reference.com. Sports Reference LLC. Retrieved January 10, 2019. ^ "Drew Brees Stats". December 20, 2011. Retrieved December 20, 2011. ^ "Game Notes". Foxnews.com. December 10, 2012. Retrieved February 18, 2014. ^ "Favre, Jets hand Titans first loss of the season". NFL.com. November 24, 2008. Retrieved November 22, 2011. ^ Justin Kubatko / Original design by Justin Kubatko – https://www.basketball-reference.com (August 6, 2009). "Quarterbacks and fourth quarter comebacks, Part 1". Pro-football-reference.com. Retrieved February 18, 2014. ^ "Brees streaking up all-time list for touchdown passes". Profootballweekly.com. Archived from the original on February 26, 2014. Retrieved February 18, 2014. 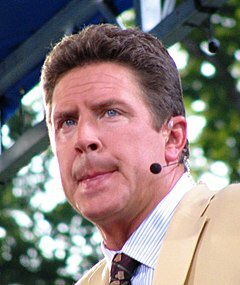 Wikimedia Commons has media related to Dan Marino.